There once was a time when I set my alarm for dawn 180 days out from our trips to book all of the hard to get ADRs. Now, on park days, I wake up in the morning and browse the Disney app with the kids to pick our day’s plans. 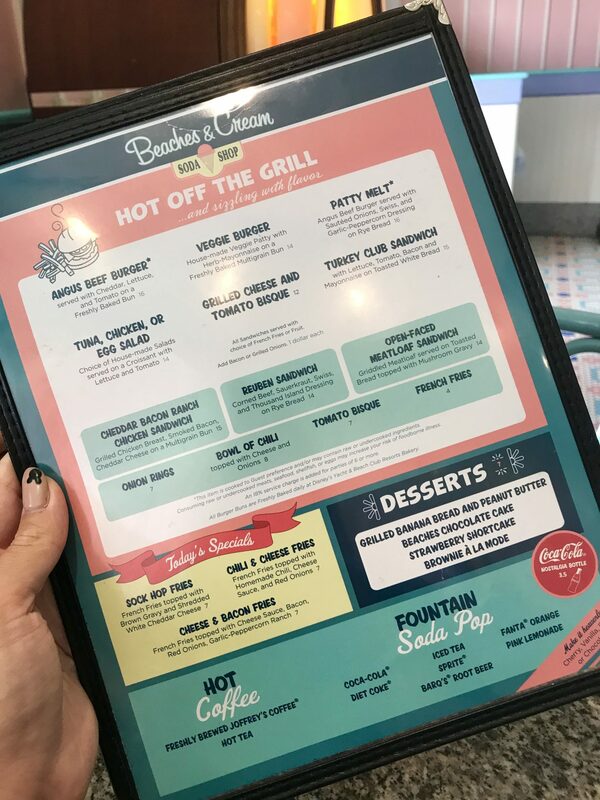 Yesterday morning was a lazy-ish Sunday, so instead of running out the door early we did some stuff around the house and just grabbed an early dinner reservation at the Beaches & Cream Soda Shop at Disney’s Beach Club Resort. 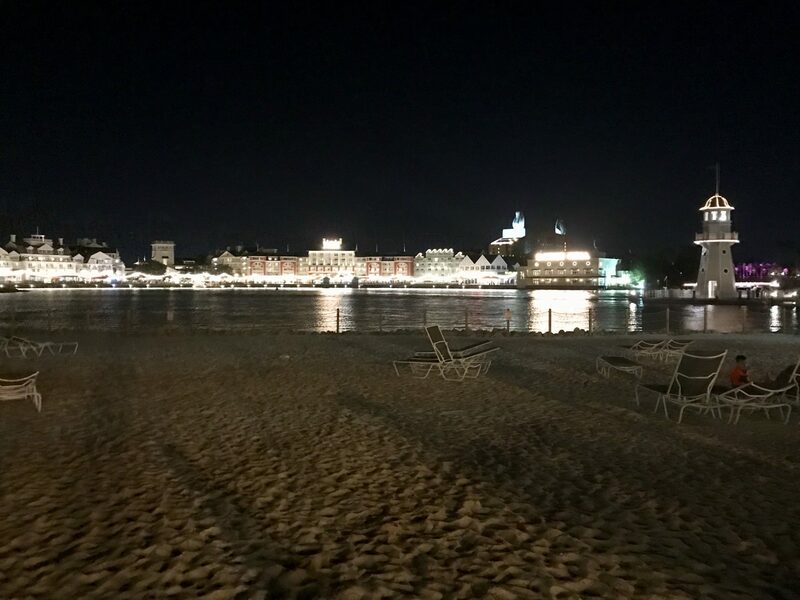 To get to Beaches & Cream, you enter the lobby of Beach Club and walk toward Cape May, then around the back of it through the open hallway, which puts you out onto the patio area behind Beach Club’s amazing pool, Stormalong Bay (which it shares with the Yacht Club). 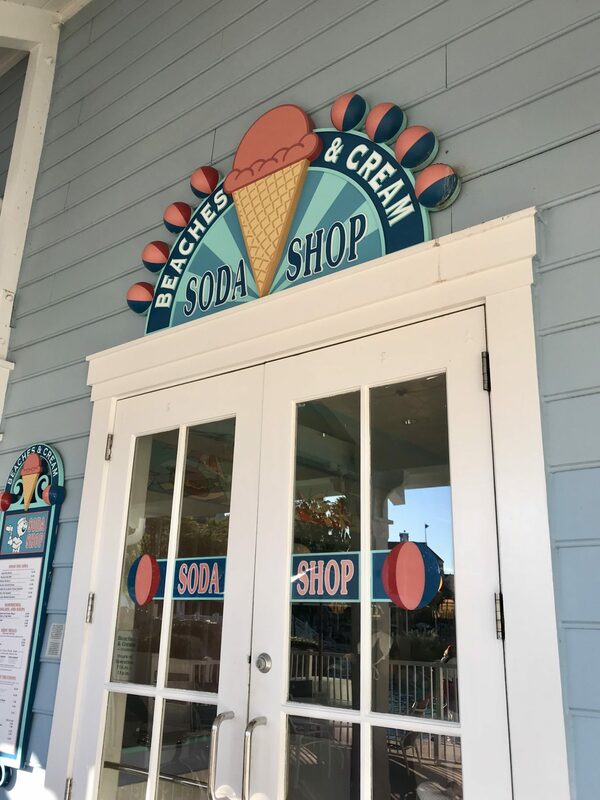 You enter Beaches & Cream back there – through either the carryout door or the main restaurant door. The main restaurant is tiny. I think I counted 10 total tables – 3 booths and 7 small round tables. Sort of explained why reservations can be so hard to get. 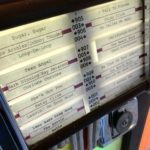 Try to get a seat near the jukebox in front if you can. 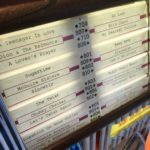 You can pick the songs that are played. I think my kids enjoyed that at least as much as the meal. 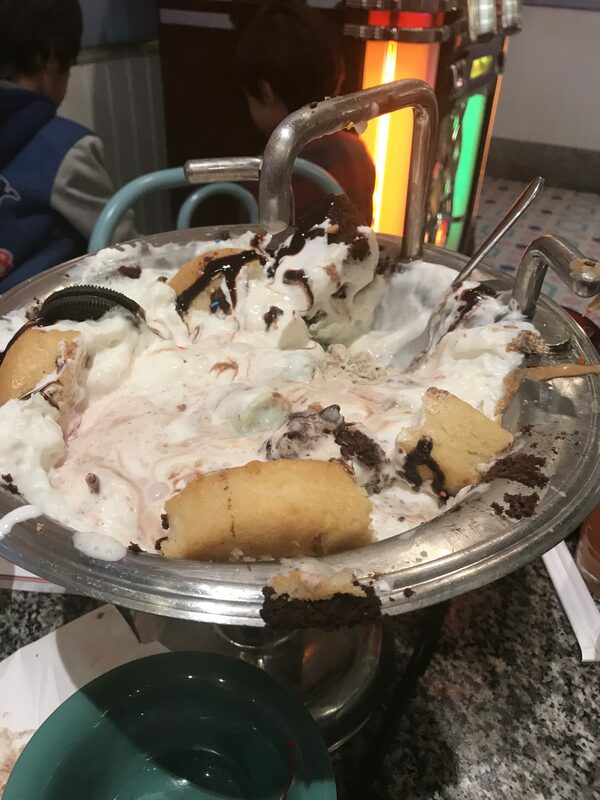 There was a lot of Sugar, Sugar and Lama Rama Ding Dong going on while we were eating. If anyone reading this was there, I apologize. 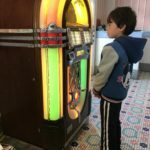 The menu is, not surprisingly, no frills 50s style diner fare. Burgers and club sandwiches, meatloaf and a Reuben. It was chilly outside and it was on the menu, so I opted for the grilled cheese and tomato bisque. All sandwiches are served with fries or fruit. 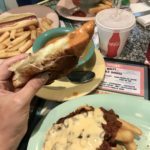 I opted for the fries and upgraded them to chili cheese. Because, you know, research. In the distance you can see the kids’ hot dog and mac n cheese. I’m not bothering with close up pictures. They were, in short, a hot dog and mac n cheese. The grilled cheese was basically a solid grilled cheese. The tomato bisque served its dipping purpose. The fries were good enough fries covered in chili and cheese sauce. 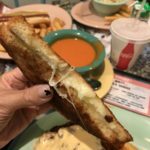 It was a good, inexpensive (the grilled cheese and bisque were $12), chill meal eaten to the tune of jukebox music just behind Stormalong Bay. 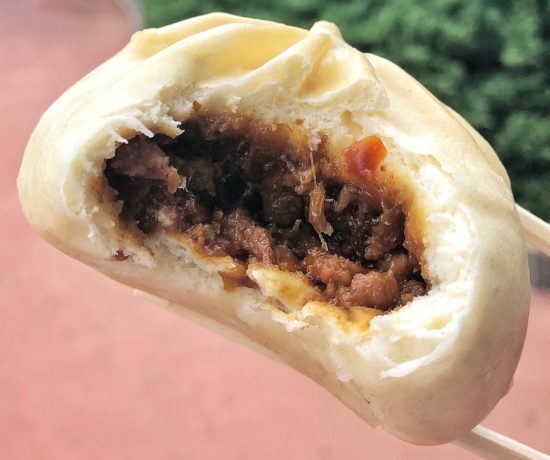 If you’re deciding between this and Victoria & Albert’s, you’ve…well, you’ve got more trip research to do – but if you want a chill meal during an Epcot or Hollywood Studios day or while you’re poolside at Stormalong, it’s a great option. 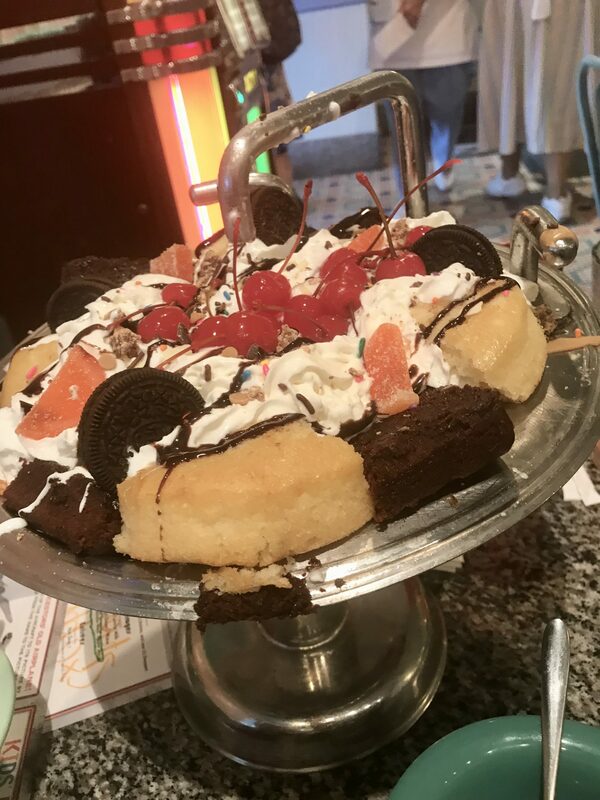 …before ordering the Kitchen Sink. You guys – I don’t even like ice cream that much and was alone with my two skinny kids, so this was hilarious. When they bring it out they put these yellow siren-style lights on and the waitress makes a big announcement to the whole restaurant, which dutifully chants back “A WHOLE CAN? ?” to the information about just how much whipped cream is in this thing. I don’t even think we’d really hit ice cream yet. People at other tables might have been laughing at us. I also might have been laughing. 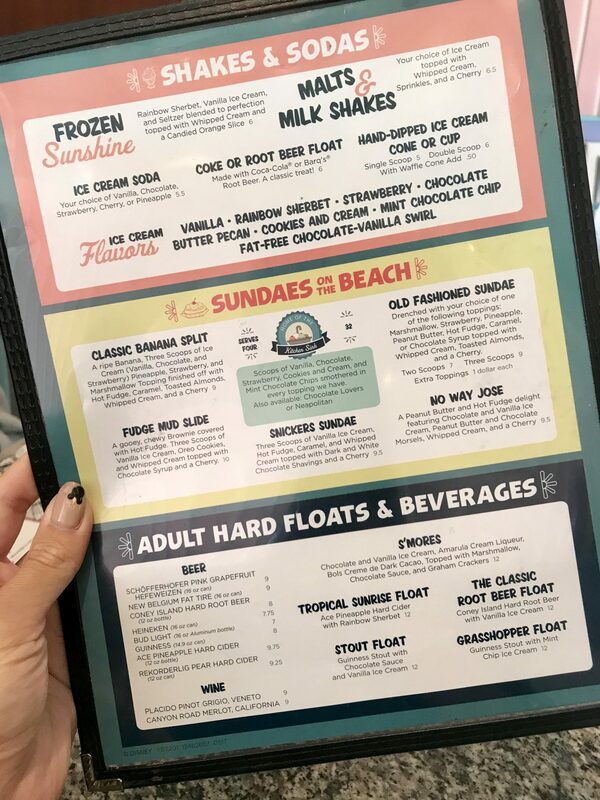 So, in short, if you want a really chill meal in an out of the way spot at a great resort, hit up Beaches & Cream. Especially if you love ice cream. 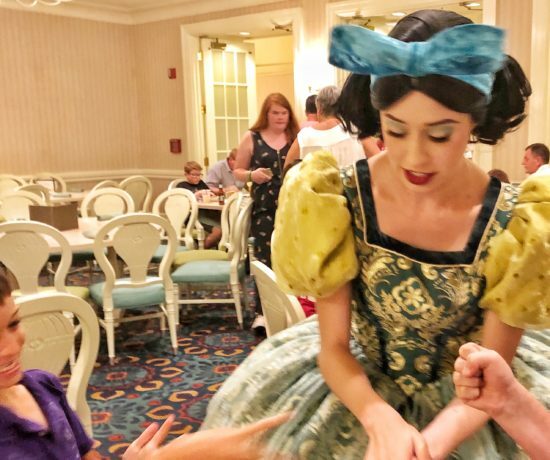 With the Food & Wine Festival currently around the corner at Epcot, I’d usually have trouble justifying it – but it was perfect for us last night. We’d planned on heading into Epcot for Illuminations afterwards but it was unseasonably chilly and I figured just as well not to push it on a school night. So instead the boys toasted marshmallows at the Beach Club campfire and played on the beach for awhile before we headed home. I befriended a lovely couple from Jersey whose child took a liking to me and the boys played with his older sister in the sand. Those little pinch-me moments overlooking Crescent Lake and the Boardwalk are my favorites these days.